Across the street from the stately Queen Anne brick house of Henry McElroy, is the more modest white clapboard home of his brother, William. A merchant, insurance agent, notary public, and justice of the peace, William acted as a link between the military traditions of his father and grandfather and the sacrifices of his sons. The greatest sacrifice came from his youngest son Flight Lieut. Victor Henry (Harry) McElroy who lost his life in World War I and was awarded the Distinguished Flying Cross for his bravery. William McElroy, a son of Patrick, was prominent in Richmond life. While his older brother Henry opened his own store and became a local entrepreneur, William worked with/for his father in his store and selling fire insurance. William was interested in being more than just a merchant (according to his biography in Richmond 150 he did not like being a merchant). In 1873 he was commissioned to collect affidavits in Carleton County and in 1875 he received his provincial commission as Notary Public. He also became an appraiser with the Canada Permanent Loan & Savings Company. He kept an office in this house and according to the reminiscences of his daughter Kathleen, it was not unheard of for clients to stay for dinner. In 1905, at the time that the McElroy store was being transferred to the Brown Brothers, William was appointed first a Justice of the Peace and then a clerk of the County Court (1906). 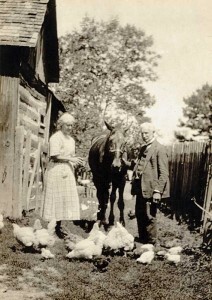 William McElroy was active in many aspects of village life. He was a member of the Orange Lodge and St. John’s Anglican Church. 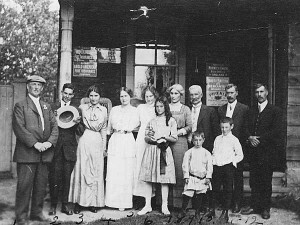 William was the Secretary of the Carleton County Agricultural Society in 1895 when the Fair moved from Bell’s Corners to Richmond. Interested in education, he was Secretary of the Richmond Union School Board and was also instrumental in trying to re-establish a library in the village. William McElroy had 12 children – six with his first wife, Edith Rielly (a sister of Hugh Rielly) and six with his second wife Emily Hyacinth Chevres. His sons continued the family’s military tradition. Their great grandfather, Sergeant Henry McEvoy had been a veteran of the Napoleonic War and their grandfather, Patrick, had been involved in local militia activities. William’s oldest son, George, was a veteran of the South African War. Another son, Lieutenant Frank McElroy, was wounded overseas in 1918. 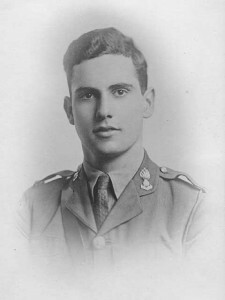 It was, however, his youngest son, Harry, who became the most decorated member in the family and possibly the most highly decorated young man born in Richmond. Flight Lieut. Victor Henry (Harry) McElroy D.F.C. Flight Lieut. Victor Henry (Harry) McElroy, D.F.C. was born in Richmond in 1897 and killed in action over France in 1918. Enemy fighters shot down his plane while he was engaged in tree top level “ground strafe” against German troops and transport. He was awarded a Distinguished Flying Cross (D.F.C.) posthumously. The medal was awarded to his father, William, on Parliament Hill in 1919 by His Royal Highness, the Prince of Wales (later Edward VIII). The citation for Harry’s medal reads as follows: This officer has been conspicuous for his courage and determination in attacking enemy troops, transport, huts, etc. on bombing raids. Carrying out this service at low altitudes, his success has been marked, and he has inflicted heavy casualties on the enemy, his machine being frequently badly shot about owing to heavy hostile fire which he had encountered. There is a plaque and memorial to Harry in St. John’s Anglican Church, in Richmond. This entry was posted in Locations and tagged commercial, House, Military. Bookmark the permalink.